Sometimes, when you finally find those perfect pair of skinny jeans, you’re left with the task of finding another perfect pair (of shoes!) Don’t panic! There’s plenty of chic shoe options to wear with your skinny jeans, but here are our favorites for the season. Watch our Stylist’s advice on pairing shoes with skinny jeans! Hi everyone. Welcome to Ask a Stylist. My name’s Alexandra, and I’m a styling manager here at Stitch Fix. Ask a Stylist is where stylists like me answer your burning style questions. Today we’re gonna be answering the age-old question: “Hey, what shoes do I wear with my skinny jeans?” Skinny jeans are an essential item in everyone’s closet, and we know that how you wear them and with what shoes really makes a difference in how you feel. So we want to give you [00:00:30] four different shoe options so you feel great every time. To take your jeans from day to night, opt for a classic high heel. There’s no need to cuff your jeans with this look because the streamlined silhouette elongates the legs and creates that legs-for-days look. If you’re not into a high heel, like me, opt for a pointed toe flat so you still get that sophistication [00:01:00] without sacrificing any style. When you wear flats, make sure your jeans hit right above the ankle bones. When you’re ready to dip your toe into the athleisure trend, slip into a pair of fashion sneakers. Fashion sneakers are my absolute favorite, you can ask any of my friends, and that’s because they are just so comfortable, and this trend is all about comfort. So lace up your favorite tennies or slide into a pair of slip-ons [00:01:30] and you’ll be ready to tackle your to-do list. When you’re feeling fall-ready, booties or boots are the perfect pair for your skinny jeans. When you’re wearing booties, roll the cuff just a little bit of your jeans so that you have that exposed ankle and you can show off any cool details that might be on your booties. If you’re looking for that sheik fall cozy winter look, tuck your skinnies into a taller boot and you’re ready to go. Have a question you want answered? Head to Ask a Stylist, and one of our expert [00:02:00] stylists will be with you in no time. Easy and a little bit refined, pointed toe flats offer a slightly exaggerated length on the foot that makes for a seriously long leg line. Pair these with your skinny jeans and a fitted button-down or a lightweight blouse for an easy, no-fuss outfit. Want to get down to some serious errand-running business? Your sneakers and skinny jeans won’t let you down and always nail that cool, woman-on-the-go vibe. If you feel too casual, wear your jeans with a structured top or jacket for a look that’s athleisure-approved. We love ankle booties so much, they’re among our favorite fall shoes of the year. We can’t get enough of the way their chunky, substantial look grounds even the skinniest of jeans. The best part? They’re ultra-versatile so dress them up with fancier blouses and jackets or down with tees and cozy knits. With the ease of flats but with some serious style credibility, mules are at the top of the shoe trends of the moment. 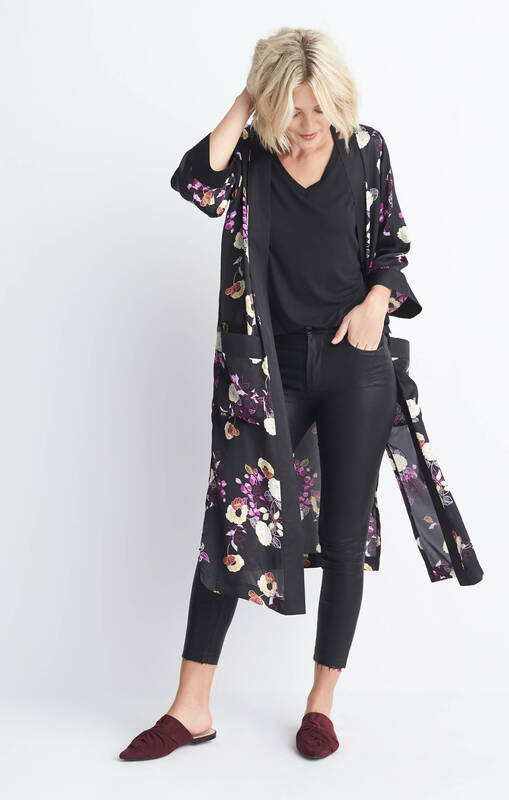 Make a stylish maneuver with skinny jeans, a top and cardigan or kimono for a layered look then simply slip on this bold, backless shoe du jour! With so many stylish shoe trends at your feet, jumping on the skinny jean bandwagon is easier than ever. What’s your favorite shoe to wear with skinny jeans? Tell us!